The new connection will make download speeds 3,000 times faster - at least for the small minority of Cubans who have internet access. It should also make international phone calls much cheaper. The 1,600km (1,000 mile) cable from Venezuela was financed by the Bolivarian Alliance for the Peoples of Our America (Alba) - a left-wing regional grouping founded by Venezuelan President Hugo Chavez. Cuban Information and Communications Minister Medardo Diaz said it "reinforced Cuba's sovereignty" and "opened a breach" in the US economic blockade. The cable would "be at the service of our people, as a tool to reinforce its development, integration and sovereignty" when it became operational in July, he added. Until now, Cuba has relied on internet and international telephone connections via satellite, which is expensive and slow. 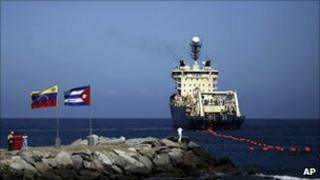 Cuba's communist government has always blamed its poor communications links with the outside world on the decades-old US trade embargo, which has prevented the installation of a fibre optic cable to Florida, just 144km away. The arrival of the fibre-optic cable has raised enormous expectations in Cuba, says the BBC's Fernando Ravsberg in Havana. According to official Cuban statistics, only 3% of the population have access to the web - the lowest figure in the western hemisphere. Access is restricted and available only with government permission - although since 2009 Cubans have been able to use internet cafes, mostly in hotels, and there is a strong black market for internet connections. Last November the official Communist Party newspaper, Granma, sought to lower expectations. "The underwater cable will provide higher quality communications, but not necessarily mean a broader extension of the same," it said. The Cuban government says there is no "political obstacle" to the internet in Cuba. But opposition groups - including the prominent dissident blogger Yoani Sanchez - say the authorities have always sought to control sources of information and free expression.